Today, President Donald Trump and Secretary of Education Betsy DeVos released their proposed budget for the 2019 fiscal year. The Trump administration’s budget proposal for this year makes strikingly similar drastic cuts to the administration’s fiscal year 2018 proposal, which represented the most devastating funding cuts to the U.S. Department of Education since Ronald Reagan’s presidency. On the heels of that widely criticized proposal, the Trump administration has doubled down this year with a $7.1 billion cut to the Department of Education’s funding—a 10.5 percent decrease from 2017 levels. And while an unusual addendum—released on the same day as the original proposal—seems to restore $3.3 billion to the education budget, Trump and DeVos have made their priorities clear: Starve public schools to fund private school schemes that benefit the wealthy. Last year, Congress ultimately maintained funding for the programs the Trump administration tried to cut. However, DeVos strived to overcome this clear rejection of her agenda by spending her first year in office trying to fulfill Trump’s campaign promise to eliminate the Department of Education. DeVos rescinded Obama-era guidance and protections for vulnerable students, downsized the department’s workforce, and pushed for the expansion of tax incentives that benefit private school parents rather than students in public schools. Through their proposed budget for the upcoming year, Trump and DeVos are taking another swing at the department and public education by proposing to gut funding specifically for supporting the teaching workforce and providing after-school programs. This year’s Trump-DeVos budget would slash $7.1 billion—10.5 percent of the Department of Education’s 2017 funding—while allowing $500 million in new money to flow to private schools through voucher-like initiatives (with another $500 million added through the addendum, for a total of $1 billion). Similar to last year, Trump and DeVos have proposed to completely eliminate funding for the $2 billion Supporting Effective Instruction State Grants Program (Title II, Part A) of the Every Student Succeeds Act (ESSA) as well as the $1.2 billion 21st Century Community Learning Centers program (21st CCLC, Title IV, Part B) of ESSA. Such cuts would hit working parents and their families the hardest. In fact, 80 percent of parents participating in 21st CCLC-funded programs say that these after-school initiatives help them hold on to their jobs since the school day often ends before the work day. 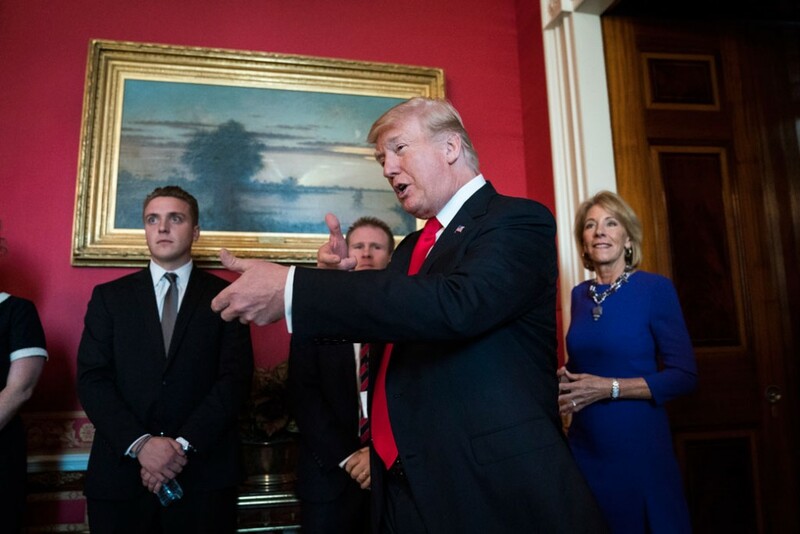 By, once again, proposing to slash funding for teachers and after-school programs, Trump is effectively recommending that Congress cut teachers’ salaries, increase class sizes, and cancel after-school programming to pay for tax cuts for wealthy parents who can already afford to send their kids to private schools. Meanwhile, working class families will bear the brunt of depleted funding for public schools and tax breaks for the rich. The following table illustrates the impact of the cuts to Title II, Part A and 21st CCLC for all 50 states and Washington, D.C.
Posted in Department of Education, Every Student Succeeds Act, Funding For Education, School Choice and tagged "Standing Strong for Public Education", #iBelieve, Accountability, Advocacy, Diversity, Education, Equity, Failing Schools, Public Education, School Choice. Bookmark the permalink.